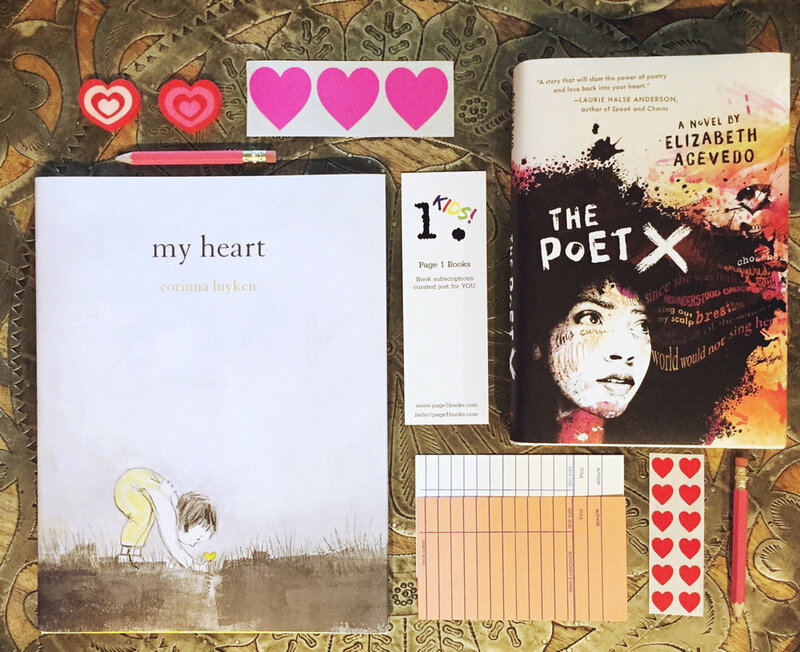 When I learned that both of my daughters would be gifted a Valentine's Day Gift Bundle from Page 1 Kids I was thrilled (I never say thrilled IRL but it’s so appropriate here). Especially because it was something that I wanted to purchase. I had already intended to give them each a book for Valentine’s Day but over the past few months, thanks to winning the Page 1 Kids giveaway I knew firsthand how exciting it was to open a box with a book that none of us knew was inside. The ladies behind Page 1 Kids had already been so generous even going so far as to sending an extra book for us to share in our Little Free Library so that some of the books we received could find a home in our personal library. To be the recipient of their kindness and generosity blessed me tremendously. They were already giving us a subscription and yet they still went above and beyond. The kind words and gestures of people that didn’t know me or my girls prior to Instagram have been one of the things that has fueled me during our book sharing journey. I love that books have opened our hearts and our world to so many people. I now find myself connected to genuinely kind and inspiring people that just want to put something beautiful out into the world whether it’s great books, information, encouragement or kindness. The Bookstagram community is a space where what you get travels with you long after you've closed the Instagram app. The plan for this special delivery had been to wait — this bundle after all was for Valentine's Day. And after days of them asking to see what was inside, I stood my ground. We would wait. Yes, I too really wanted to see what was in that box they've immediately come to recognize but this was for Valentine's Day. Our hearts have experienced a range of emotions over the past two weeks and we were all thankful for the pause Page 1 brought us — moments of excitement as the girls opened and unwrapped the box and its contents and the moments we will share as we read and share these stories. My little one has already one her book with her nana. Unsurprisingly, the Valentine’s Day Gift Bundle was more darling than I imagined. And once again, we experienced pure delight as the girls unwrapped their books and we all saw what was inside. Two books that I had been looking to get for them. Two books that I wanted to read with them just as much as I wanted to share them. Two books that were specifically and perfectly selected for my daughters, one 6, one 14 (and seeing your teen get excited about a book is a beautiful thing!). They were gifted two books about love and so much more, perfect for every day not just Valentine's Day; a package wrapped by people who love what they do (and so do their families! Did you see their Instagram post of their little helpers?!). But by now I've come to know, that's just what they do at Page 1. They harness an ability to curate lovely boxes using their heads and their hearts. They run a business and their good at it but if you ever reach out to them, they feel like friends. Each box feels personal, not mass produced or filled random contents. I’m not sure there's a method to their genius other than a desire to give something great — we’ve gotten things like a glimpse into history, a peek other places and cultures, lessons on love in its many forms, being courageous and kind, a reason to be more intentional about spending time together. I’ve shared our Page 1 Kids Gift Subscription boxes on Instagram the last few months. You can find them using the hashtag #littlelightloves_page1kids. Book subscriptions can be purchased for 3, 6 or 12 months and are tailored to the reader. You just provide information such as the age of the reader, their reading level, interests and whatever else you’d like to share. It’s so easy, and so worth it. And now you've gotten to see our Valentine's Day bundle. We heart it! I just checked and it’s sold out but Page 1 is currently offering a discount code through Valentine’s Day so now is a great time to try their subscription (they have an adult one too) and they have a Kids Book Bundle on sale! Finally, I want to note that each time I shared our box it was because we loved what they sent our way and I really believe in what they are doing. I adore the people behind Page 1 that I've come to have contact thanks to email and Instagram. Winning the giveaway did not come with the stipulation that I had to share nor did receiving these Valentine's Day bundles. But what they have is worthy of sharing and I am excited to see what they have in store for us all in the future. They help make reading an experience. They value books. They value people. They value the time you spend reading them. Essentially, as a customer, and as a person, they value you. Thank you Page 1 Kids for gifting us (I say us because my girls love sharing with their mama!) these Valentine’s Day Bundles!